Laura Stockton is part of a team that took some time to find its way — just in time for the NCAA tournament. Called "gritty" but not always "pretty" by head coach Lisa Fortier, the Gonzaga women actually struggled throughout most of the season. Their regular-season championship came down to the last home game and a tight five-point win, and success in the West Coast Conference tournament wasn't a given as they headed to Las Vegas. Coming into the tourney, the question on fans' minds was "Which Zag team is going to show up?" Would it be the Gonzaga team that blew out BYU by 35 points in the Kennel, or the Gonzaga team that collapsed in the fourth quarter down in Provo in their final regular-season game, turning a six-point lead into an eight-point loss? They answered this question loud and clear, routing Pacific by 32 points and San Francisco by 31. In the title game, after leading Saint Mary's by 21 at halftime and seeing that lead cut to six points in the third quarter, they didn't fold their tent; instead they picked themselves up and won by 11. Recall that Gonzaga opened WCC play with inexplicable losses to Pepperdine and Pacific. Two games into the season and the Zags, favored to win the conference, found themselves in last place. Three wins in a row got them back on track. Then came the always-tough game at Saint Mary's — behind Jill Barta's 33 points, they came from way behind and won by four. They would extend their winning streak to 12 games. Still, most didn't come easy. Two weeks later at San Diego, they were staring at a third conference loss when they got a pivotal stop, giving them the ball with next to no time remaining. Laura Stockton threaded a perfect pass to a streaking Barta, whose layup went in at the buzzer. A week later was the home game against BYU, when the Zags played maybe their best game of the year, comparable to winning at Stanford in November. Two days later at Santa Clara, another nail-biter — with two seconds remaining and down by one, it was Barta again, calmly sinking two free throws to seal the win. The return game with Saint Mary's at the Kennel? Another nail-biter. This time, Stockton's late-game heroics saved the day. Why all of the too-close-for-comfort games? Why the inconsistency? 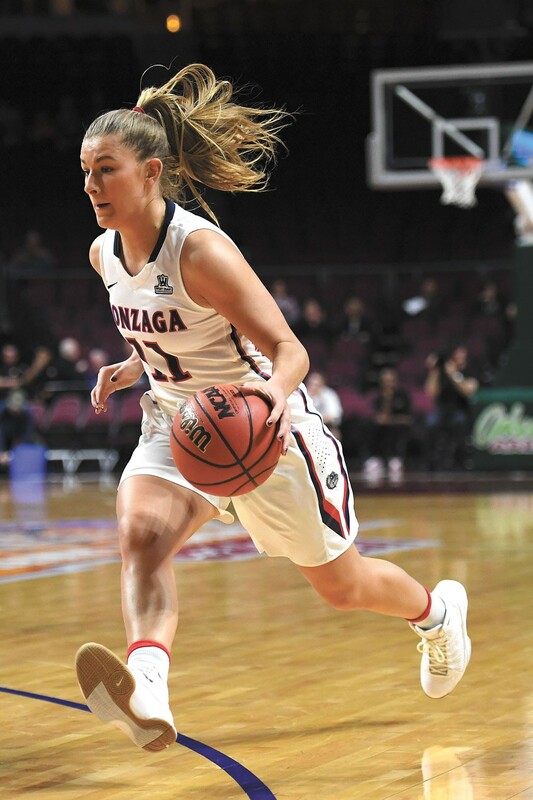 Here's my take: While Kiara Kudron has been consistently strong all year, Elle Tinkle played her usual great defensive game and Barta would, as the coaches often say, "get her points," until the WCC Tournament, this team was still a work in progress. Emma Wolfram, coming back from ACL surgery, worked all season to round into form. At 6-foot-5, her presence can be so intimidating that Barta no longer has to plant herself on the low block, there to face a triple team every time she touches the ball. Barta can now move around, allowing her to be more active and creative. Her tournament-record 37 points against Saint Mary's in the WCC title game is a case in point. And let's not overlook the development of freshman Jesse Loera; her ball-handling skills and speed are impressive. Add Chandler Smith to the mix, and Fortier knows that she can rest Stockton and not worry. All this season-long "work in progress" came together in Las Vegas. One announcer said that "this is a really, really good basketball team." The NCAA Tournament field might soon discover just that. Gonzaga, an 11 seed, faces 6-seed Oklahoma in Seattle on Saturday, at 5:30 pm, on ESPN2.